← How could we describe what really means to Be Bolivian? The whole World witnessed ‘Bolivia said No’ … evo: finish your term and go home! There were festivities in Switzerland, Italy, France, USA, Spain, Argentina and Peru. 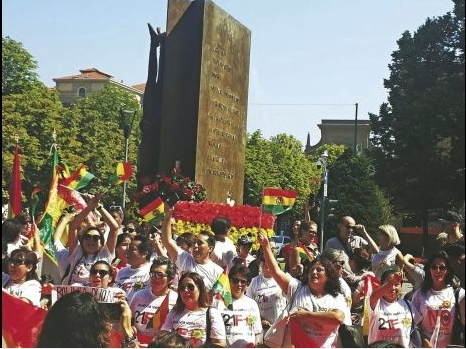 Bolivians who reside outside the borders met to celebrate the national anniversary and raise their voices of protest with the slogan of ‘Bolivia said No’. Residents living in Italy, Switzerland and France, for example, wore white shirts with the slogan of Bolivia said No, banners with messages of respect for the results of the constitutional referendum of 2016, the democratic system and launched white balloons and flared the national tricolor to commemorate the 193 years of Bolivia. “A big greeting for our country in these 193 years of independence. Tell them that we Bolivians in Geneva (Switzerland) do not forget and we will fight for our democracy to return times of sovereignty”, is part of the message that Bolivian Nina Suárez raised, through the Facebook network. Other Bolivian residents in Geneva also met to celebrate the national anniversary and for the occasion wore typical clothes from the eastern region of Bolivia. The contrast to that demonstration was in Argentina, where Bolivian residents, together with the Bolivian ambassador, Santos Tito, placed a wreath at the foot of the monument to José de San Martín, in the capital Buenos Aires. The ambassador to the United Nations, Sacha Llorenti, along with a Bolivian delegation, hoisted the flag and intoned the notes of the National Anthem in New York (United States). In Valencia (Spain), the Bolivians made a brief folkloric entrance with a demonstration of typical dances. In Puno and Arequipa (Peru) there was also celebration. This entry was posted in Bolivia, Holidays, Politics, Social Unrest and tagged corruption in public office, demagogue, democracy in peril. Bookmark the permalink.